Some people, when they think of Argentina, think of Messi. They think of an Incan sun and Patagonia. Some think of Spanish-speaking, rice-and-beans-eating, South Americans. Perhaps the more savvy think of empanadas and maté instead. 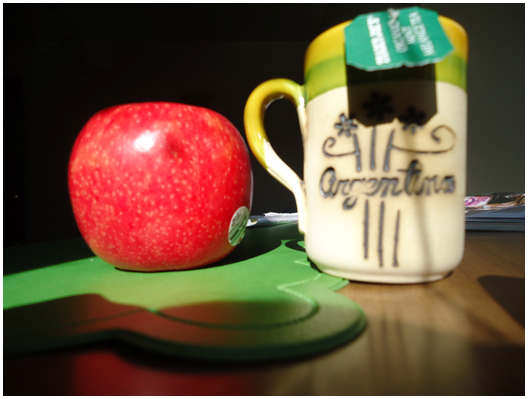 When I think of Argentina I think of red delicious apples and SleepyTime tea. It was my American friend, Emma’s, and my daily 5 o’clock merienda ritual. Those afternoons represent so many significant things for me-voicing my worries about class, celebrating going out on our first Argentine dates, complaining about colectivo traffic, and clarifying Spanish grammar. Her apartment was a second home-a place to cook dinner, chat with her Argentine and Puerto Rican roommates, study, procrastinate…It was the place I found a kindred spirit-an overly devoted Spanish learner, a perfectionist, a constant worrier-and the comfort of knowing we were experiencing so many similar feelings as being foreigners. When I think of Argentina, I think of a Bolivian-Johnny-the produce vendor across the street from Emma’s place. He was the supplier of our merienda apple addiction—that is-red delicious, bien duro (very crisp) apples. It didn’t take Johnny long to figure out the preferences of his new, avid produce eating, American costumers. He’d choose yellow, not-too-green bananas, select the freshest spinach, cut pumpkin circles to exactly ¼ inch, and of course, pick the crispest apples. When I think of Argentina, I think of how resistant I was to get to know this Bolivian. After all, Argentines look down on their produce workers, largely Bolivian. “They come and use our free health care,” Argentines would tell me, or would scoff at my audacity to go there. Likewise, in the US, produce is but a section of a massive grocery store, and we do not talk with the workers but to ask where that obscure item on our list- kohlrabi or medjool dates- might be located. Gradually, I came to appreciate Johnny, even beyond his superb produce-selecting skills. He was part of our sacred ritual: class, stopping at the produce stand, apples and tea in Emma’s apartment. He became a familiar face, a person genuinely concerned about my day. Our lives and treatment were so different as foreigners, but we still suffered the stereotypes-whether as Americans or a Bolivian-together. Although it so different than the support I sought in Emma, Johnny challenged me to cross language-barriers, trump stereotypes, defy prejudices, and learn the importance of relationship building, even with your produce vendor. When I think of my last few weeks in Argentina, I think of one of our last rounds of buying apples for merienda, but this time, with Emma’s Argentine roommate. “Está dándoles un descuento” (“He’s giving you a discount”) he stated, matter-of-factly as we returned to Emma’s apartment. Sure enough, after comparing the prices of bananas, spinach, and other common items with the prices her roommate was paying, a stunned Emma and I found out Johnny had been giving us a discount for the entire six months we had been his faithful American costumers. Bits of Johnny’s story: his dreams of saving money to become a police officer, his long commute, and his immigration from Bolivia burned in my mind. And I thought, although Johnny really didn’t have the means to spare an extra dime on two Americans, perhaps it was his way of showing he genuinely cared. So when I think of Argentina, I think of a very generous Bolivian, willing to sell some discounted, very crisp red delicious apples to change stereotypes, to cross barriers, and because maybe he knew that for his counterpart American foreigners, we wouldn’t be able to consume our Argentine merienda of apples and tea without thinking of and thanking a Bolivian. Jessica Seline is a student at University of Wisconsin-Madison and studied abroad with IFSA on the Argentine Universities Program in 2012.